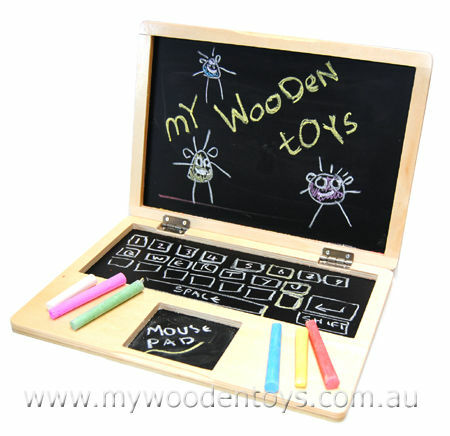 Wooden Blackboard Laptop Toy is a fantastic creation which finds a lovely balance between a modern everyday object and a traditional chalkboard toy. Putting together a blackboard which has been used for generations and a laptop is just plain clever. This toy notebook has three chalk board surfaces and comes with six pieces of coloured chalk. Just like a real laptop it has hinges and closes. The chalk can be stored inside. This Laptop is made from varnished plywood is lovely and smooth and stands in the open position without falling over as it has nicely recessed strong steel hinges. A wonderful toy and a personal favorite. Size: Closed dimensions are 28cm long x 20cm wide x 2cm thick. Open it stands 21cm high. Material: Wood and Varnish. Steel Hinges. We like this because: "Much less temperamental than a real computer."